The decade since the first extra-solar planetary discoveries has seen the field mature into a vibrant discipline at the heart of astronomical research. Strategic planning processes around the globe have placed extra-solar planetary science at the core of the "Big Questions" for future investment. ALMA will reveal planet forming disks around young nearby stars, and the space-based missions COROT and Kepler will search for earth-like planets around solar-like stars, feeding both current and planned facilities like Europe's Very Large Telescope (VLT), the Hubble and Spitzer Space Telescopes (HST and SST), the next generation James Web Space Telescope (JWST), future space interferometry missions like Darwin, and the new breed of 30-50m Extremely Large Telescopes (ELTs). The European Space Agency's (ESA) "Cosmic Vision 2015-2025" proposal process (currently taking place) will select the space missions that will, over the next 2 decades, provide the technology to reveal planet properties and their potential for life. 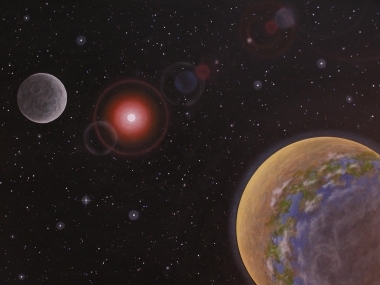 However, Sun-like stars represent only a small fraction of potential planet hosts, and the full variety of habitable planets may orbit a wide range of different types of star. Probing for planets around different types of star is a relatively new field, but the great potential and importance as well as the opportunities to capitalise on current and future investment, make this very much a growth area. The RoPACS network is focused to discover and study extra-solar planets around by far the most common potential planet hosts, cool stars. We will open up this field via the exploitation of a major new survey being led by two of the node leaders (Pinfield & Hodgkin). This survey has been awarded 200 nights (as a Campaign Proposal) with the Wide Field Camera (WFCAM) on the 4m UK Infrared Telescope (UKIRT) to search for planets via the transit method at, for the first time, infrared wavelengths. Planet discoveries from the WFCAM Transit Survey (WTS) could be small and rocky, and may be warm and potentially habitable worlds, and would be ideal targets for the new breed of highly stable infrared spectrographs including UPF and NAHUAL). The network's industrial component will contribute to mission systems development in the European Space Agency "Cosmic Vision" design phase via combinational engineering and astrophysics research with our industrial partner Astrium. This will improve inter-sectorial understanding of both engineering requirements and constraints for planet measurement in a number of key areas, including satellite formation flying for interferometry, the cooling systems required for sensitive space-based infrared measurement, and crucially, the potential benefits of incorporating polarimetry into Cosmic Vision missions. How does planet formation depend on the host star? What is the full range of stars around which habitable planets may be found? How does our solar system relate to the full diversity of planetary systems? How may we best use future technology to discover and measure the full variety of potentially habitable extra-solar planets? The network will train early stage researchers (ESRs) and young experienced researchers (ERs) with astronomical, computational, mathematical, and technical skills to measure, simulate and interpret scientific observations of extra-solar planets and the technologies used to observe and characterise them. It will also provide transferable skills such as multi-language programming, pipeline analysis techniques, the use of mathematical algorithms, spectroscopy, effective use of databases, engineering design techniques, and education/outreach practices. Career prospects will thus be enhanced both inside and outside academia. The network will also deliver multi-lingual science-based hands-on classroom activities via courses run for teachers and schools, through our educational partner. This will help inspire the next generation of scientists about the search for planets and life elsewhere. To achieve these goals the network is interdisciplinary and inter-sectorial, including astronomers (observational and theoretical), synthetic spectral modellers, designers and manufactures of space technology, and educationalists.